Best ever opening weekend in Britain? Audiences in floods of tears? Spontaneous applause at the end? 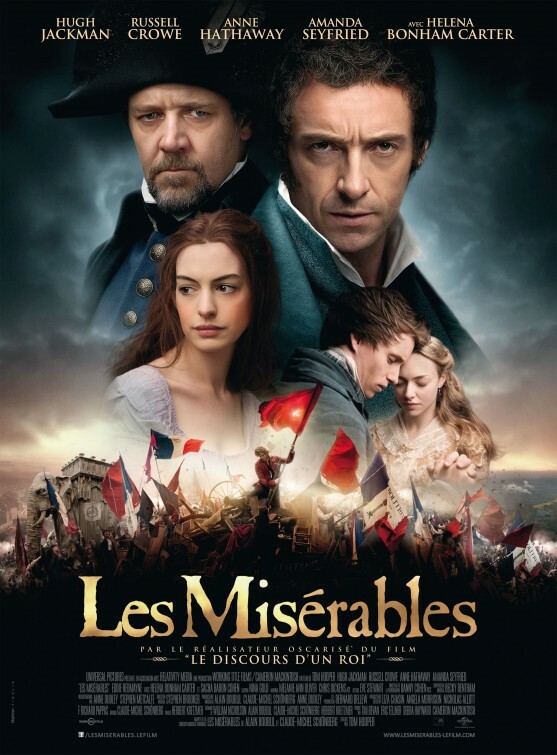 A musical that even has a nickname, Les Mis / Miz? (though I put that down to the irritation of typing in acute accents). I’m not so easy with the sort of stage musicals mined by X Factor / Pop Idol contestants for big emotive ballads. I enjoyed Joseph & The Amazing Technicolour Dreamcoat done by a primary class (with my son, then 8 in the back row of the chorus: we were so proud) as much as the revived full scale production. i.e. most of the tunes still work with one teacher on piano and wobbly little voices. I remember Jesus Christ Superstar fondly, with Murray Head and Yvonne Elliman. But most of it? Ah. Can’t stand Evita. I saw Phantom of The Opera in the West End production and thought it atrocious. Dire music, awful plot, overwrought performances. As we came out, I said, ‘That’s one of the worst things I’ve ever seen in the theatre’ (to the utter surprise of my companions). There are getting on for fifty songs in Les Misérables. I’ve never seen it in the theatre, and never listened to the soundtrack. So I’m walking in as a blank sheet, and a somewhat cynical edge to the blank sheet. The full orchestral backing is magnificent, soaring throughout. There’s nothing modern … just a touch of acoustic guitar a couple of times. This is the full on French drama, the Jacques Brel / Edith Piaf declaiming in song. Many of the songs are merely recitations to music with a bit of a tune bolted on, and I’d say 95% of the voices you hear are singing, with just a few connecting dialogue lines. 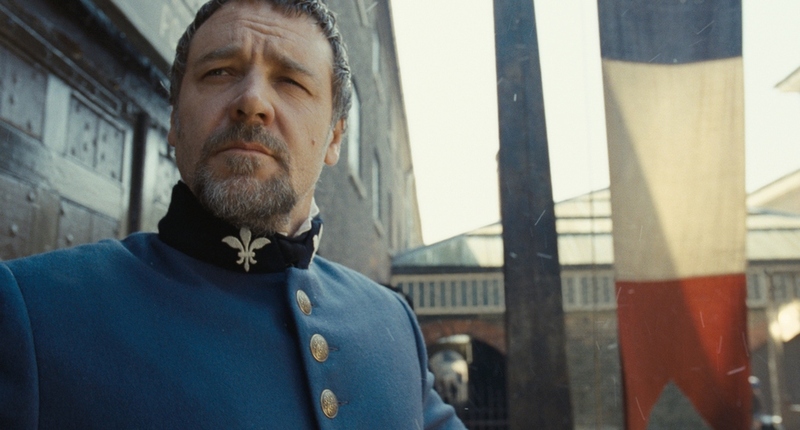 All the vocals, it is claimed, were done live on set with no overdubbing, although I have my doubts about the singing fight scene between Hugh Jackman as Valjean, and Russell Crowe as Javert. They are fighting vigorously while duetting and they don’t lose a breath. The singing is always extremely clear. You can hear all the way through that these are actors singing … none of them is a Pavarotti, nor even a Tom Jones or a Shirley Bassey when it comes to vocal power. The result is all the more affecting for that, and I’m convinced “big” singers would have lost the words often. Our singing actors never do. As the entire plot is conducted in song, this is essential. I’m also sure that singing live assisted this. However well something is overdubbed, there is a necessary remove. Most musicals are overdubbed, but so is much plain Hollywood dialogue. Back in the 50s, it was quite common to have an actor on screen in a musical with a different known singer providing the soundtrack. The actors succeed admirably, though ‘no overdubbing’ does not necessarily mean “no post production tweaking” and it is easy to manipulate vocal glitches or flat notes without overdubbing. 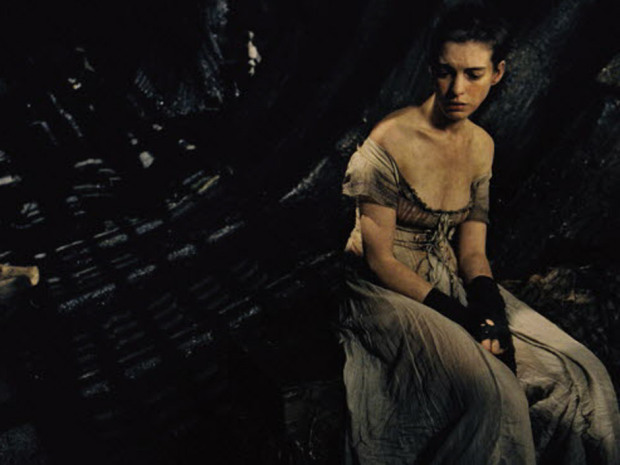 Anne Hathaway as Fantine: sans hair, sans tooth, sans pride. There are great songs. Anne Hathaway’s I Dreamed A Dream early on is outstanding, both in melody and in her performance. Hathaway genuinely lost her hair for the role, and her reappearance in ghostly form in the last few minutes is obviously the one that had audiences crying. The big rousing anthem which we hear twice, including by the whole cast at the end sends you out of the cinema singing, though I also wanted to break into The Marsellaise and barricade the Empire Cinemas car park. All the performances are outstanding. Sacha Baron Cohen and Helena Bonham-Carter (who were together in Tim Burton’s Sweeney Todd) are a natural comedy double-act, with impeccable timing. Bonham-Carter really doesn’t mind obscuring her natural beauty in films, and revels in it. Cohen is so much better when being directed (here, Hugo, Sweeney Todd) than he is running out of control on his own material (Bruno and The Dictator are nowhere near as funny as Borat). The make up throughout deserves its own Oscar. Often actors are in close up for a long time because they’re singing, and the filth and squalor of the prostitutes at the docks, then of early 19th century Paris … or rather Parisians … is represented with detailed make up. The close ups linger on every detail of the singer’s faces. There are three time points: 1815, 1823 and 1832 and everyone ages correctly. Jackman with a beard when Valjean first appears in the 1815 time frame, first as a prisoner / slave, then as a fugitive, is unrecognizable. It’s a big, big drama. The leavening of comedy is only from Cohen and Bonham-Carter, apart from that it’s unrelenting misery, pain, sorrow, sadness, exploitation, degradation and struggle. They sing in rain, they sing waist-deep in water, they crawl through sewers. Both Jackman and Crowe have such intensity that their many confontations have almost tangible magnetic fields hovering between them. The child actors are first-rate. Samantha Banks as Eponine is so attractive that I couldn’t see why the dashing revolutionary Marius went for the inspid Cossette (which is played perfectly: this is not a criticism, that’s Victor Hugo’s character). The huge scenes of the dockyard at the beginning (to the strains of Look Down), and the failed revolution at the barricades of 1832 are cinematic tours de force. 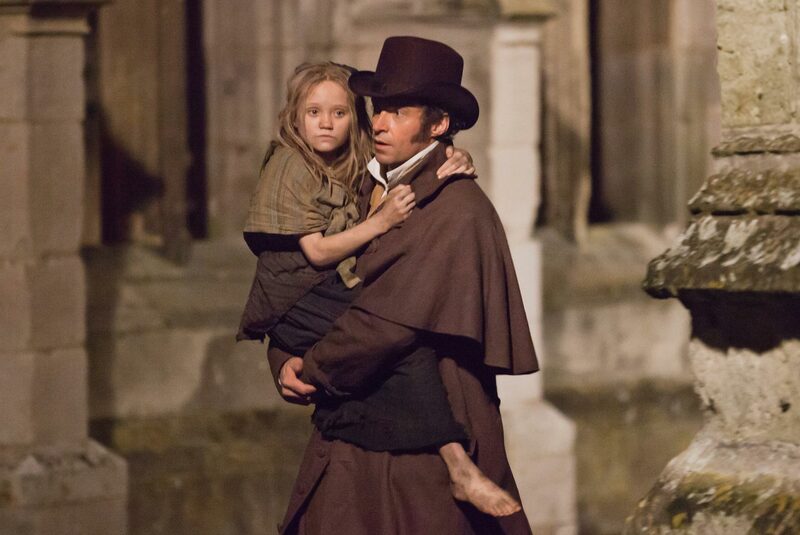 I didn’t burst into tears, but I had a lump in my throat at Valjean’s demise, though it was the wan appearance of Fantine (Hathaway) that invoked it, and yes, the audience did applaud at the end. I would have said that Jackman and Hathaway deserve Oscars for starters. As Hathaway got unfair criticism for One Day, I add that she, and both Australians, never deviated from perfect English accents throughout. The only bit of comic français was from Sacha Baron-Cohen, but he only turned it on (in semi-song) when welcoming the day’s customers (or rather punters or marks) into his pub. Always very humorous to listen to Americans and Englishmen to speak “Francais”!